This chicken taco filling is easy to put together but packed with flavor. 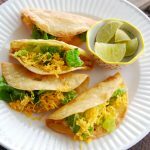 Take your tacos to the next level with this flavorful, 30-minute meal! Add onion and cook until translucent and starting to brown. Add seasonings and let bloom for about 2 minutes. Add chicken stock and scrape up any bits stuck to bottom of the pan. Simmer until almost gone, about 7 minutes. Use in your favorite taco shells or fry your own (recipe on blog).